Ernest & Celestine (French: Ernest et Célestine) is a 2012 Franco-Belgian animated comedy-drama film directed by Stéphane Aubier, Vincent Patar and Benjamin Renner. The film is based on a series of children's books of the same name published by the Belgian author and illustrator Gabrielle Vincent. The film was selected to be screened in the Directors' Fortnight section at the 2012 Cannes Film Festival, as part of the TIFF Kids programme at the 2012 Toronto International Film Festival and at the 2013 Hong Kong International Film Festival. It was selected for the grand competition at feature film edition of the 2013 World festival of animated film Animafest Zagreb and was screened as the opening film. The film was released in the United States in 2013 by GKIDS. There is also an English dub that was released on 28 February 2014, with the voices of Forest Whitaker, Mackenzie Foy, Lauren Bacall, Paul Giamatti, William H. Macy, Megan Mullally, Nick Offerman and Jeffrey Wright. The film received widespread critical acclaim, and became the first animated film to win the Magritte Award for Best Film. It was nominated for Best Animated Feature at the 86th Academy Awards but it lost to Disney's Frozen. Celestine is a young mouse who lives in the underground world of rodents. At the orphanage where she lives, the caretaker known as the Gray One tells scary stories about the evil nature of the bears that live in the outside world, though Celestine doubts they are entirely true. She loves to draw but must soon study dentistry, since that's what all rodents do, and to prepare, she must travel above ground to collect bear cubs' lost teeth from underneath pillows. On one such occasion, the cub's family catches Celestine in the act and chases her into a trash can where she is trapped and spends the night. The next morning, a destitute and starving bear named Ernest discovers Celestine and attempts to eat her. Celestine convinces him to let her go by helping him break into the basement of a candy shop, where he can eat his fill. He is soon caught by the store's owner, however, and arrested. Celestine, who is behind on her quota of collected teeth, agrees to free him from the police wagon if he will help her break into and rob the teeth from the office of the store owner's wife, who happens to be a dentist. Although the robbery initially seems successful, the pair soon find themselves being pursued by the police forces of both the mouse and bear cities. They manage to evade capture by stealing a van, and escape to Ernest's remote cabin. Ernest is initially reluctant to allow Celestine to stay with him, but they begin to bond after he discovers her love of art. He reveals to her that his current destitution is a result of his rejection of his family's plan for him to go into law, like his ancestors, due to his desire to become an entertainer. The two spend the winter happily together, though their joy is somewhat dampened by the constant radio broadcasts declaring that both police forces are still searching for them. In the Spring, the police are able to track the stolen van to the cabin. Ernest is arrested by the mice, while Celestine is arrested by the bears. Both are simultaneously put on trial, in the main floor and basement of the same courthouse. Though each of them protest their unfair treatment along with the government's bias and prejudice, as well as refusing to sell out their respective companion, the furious judges refuse to listen. Ernest and Celestine then call the judges and the rest of the higher class out on their cruelty to the lower class common folk. During the proceedings, a fire is accidentally started in the courthouse, and while the rest of the citizens flee despite the furious judges' demands to stay, Ernest and Celestine each stay behind to rescue their respective judges. The judges are both humiliated and broken that their people, the ones they thought they could always rule, have abandoned them to save their own lives while the ones they sought to wrongfully punish are their saviors. Having truly admitted defeat in their own hearts, the shameful judges drop the charges against them and have no other choice then to grant their wish to be able to remain living together. All the while, the judges express their inability to comprehend the concept of unconditional bonds; and can only watch along with the shaken populace of each place as the courthouses burn to the ground. Reunited in Ernest's cabin, the pair decide to write and illustrate a book, telling the story of their friendship, though with some embellishments after Celestine protests including the part of their meeting where Ernest attempted to eat her. Ernest & Celestine received acclaim from critics. The film review aggregator Rotten Tomatoes reports that 97% of critics have given the film a "fresh" rating, based on 77 reviews with an average score of 8.2/10; the general consensus states: "Sweet and visually charming, Ernest & Celestine offers old-fashioned delights for animation lovers of all ages." Metacritic assigns a score of 86 based on 22 critics, indicating "universal acclaim." Andrew Chan of the Film Critics Circle of Australia writes, "The result is a human story of two unlikely allies, a mouse living in harmony and befriending a bear. It is essentially that simple and it works just fine." Writing on Roger Ebert's website, Glenn Kenny of MSN awarded the film 3½ stars out of 4, praising it for its positive messages of friendship. Kenny wrote: "Ernest and Celestine is the coziest movie you'll likely see all year. Every frame is suffused with a fireplace kind of warmth that, for me at least, cast an immediate spell that didn't let up." The film premiered at the 2012 Cannes Film Festival on 23 May 2012 and was theatrically released on 12 December 2012 by StudioCanal. It was also released on DVD on 16 April 2013 by StudioCanal. In June 2013, the film won the Award of the Hungarian National Student Jury at the 8th Festival of European Animated Feature Films and TV Specials. ^ "Ernest et Celestine – Ernest & Celestine". StudioCanal. British Board of Film Classification. 27 March 2013. Retrieved 28 March 2014. ^ "Ernest & Celestine". jpbox-office. Retrieved 9 February 2014. ^ "Ernest & Celestine (2014)". Box Office Mojo. Retrieved 22 January 2016. ^ Leffler, Rebecca. "Cannes 2012: Michel Gondry's 'The We & The I' to Open Director's Fortnight". The Hollywood Reporter. Retrieved 25 April 2012. ^ "2012 Selection". quinzaine-realisateurs.com. Directors' Fortnight. Archived from the original on 26 April 2012. Retrieved 25 April 2012. ^ a b "tiff.net". Retrieved 7 September 2012. ^ "HK Neo Reviews". Retrieved 25 March 2013. ^ Chitwood, Adam (3 February 2014). "Trailer for Best Animated Feature Oscar Nominee ERNEST & CELESTINE". Collider.com. Retrieved 29 October 2014. ^ Engelen, Aurore (3 February 2014). "Ernest and Célestine triumphs at the Magritte Awards". Cineuropa. Retrieved 3 February 2014. ^ "Characters". Ernest & Celestine. Retrieved 29 October 2014. 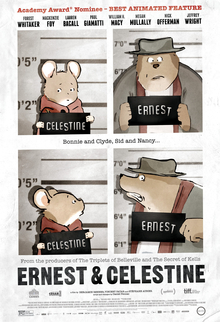 ^ "Ernest & Celestine". Rotten Tomatoes. Flixster. Retrieved 26 December 2013. ^ "Ernest & Célestine". Metacritic. Retrieved 30 March 2014. ^ Andrew Chan (29 April 2013). "Ernest & Celestine". [HK Neo Reviews]. ^ Kenny, Glenn (14 March 2014). "Ernest & Celestine". RogerEbert.com. Retrieved 30 March 2014. ^ 11. Kecskeméti Animációs Filmfesztivál 8. Európai Animációs Játékfilm Fesztivál. Kecskeméti Animáció Film Fesztivál. 2013. ^ Staff (16 January 2014). "2013 Academy Awards Nominations and Winners by Category". Box Office Mojo. Retrieved 16 January 2014. ^ Koch, Dave (16 January 2014). "Animated Film Oscar Nominations". Big Cartoon News. Archived from the original on 16 January 2014. Retrieved 16 January 2014. ^ "Complete list of 2013 Annie Award nominees for animation". Los Angeles Times. 2 December 2013. Retrieved 3 December 2013. ^ "Palmarès et nominations du Festival de Cannes". Allo Ciné (in French). AlloCiné.fr. Retrieved 16 January 2014. ^ Amidi, Amid. "Ernest & Célestine wins the Cesar Awards". Cartoon Brew. Cartoon Brew. Retrieved 16 January 2014. ^ "La animación coge fuerza en el FICX". Gijón Film Festival (in Spanish). 5 November 2012. Retrieved 16 January 2014. ^ ""Ernest & Célestine" wins LAFCA award". Wallonia. Wallonia.be. Retrieved 16 January 2014. ^ "Prix et nominations : Les Magritte du cinéma 2014". Allo Ciné (in French). AlloCiné.fr. Retrieved 16 January 2014. ^ International Press Academy (2 December 2013). "The International Press Academy Announces Nominations For The 18th Annual Satellite Awards™". PR Newswire. Retrieved 3 December 2013.